Begin by sharing the title of the book, while covering the book cover itself. Ask students to make predictions about what this story could be about based on the title and their knowledge. Record observations on butcher’s paper, on an e-note on the interactive whiteboard or in a class ‘Wondering Book’ pointing out that our ideas have been generated before reading the book. Investigate the illustrations on the front and back cover and ask the students what predictions we can now make about this book. Record ideas as noted above. Ask students if the illustrations look similar to a style of painting they have seen before. Some students may suggest Aboriginal dot paintings. Ask students to predict what the different characters might be like. Consider the placement, gestures and stance of each lizard on the back cover. Use post-it-notes to record ideas ‘I am Zoro and I am __________ ‘ (big, the boss, the smallest, etc.) and place on the back cover. What did we learn about the different characters? What words did Kirra Somerville use to describe each character? Why would Kira Somerville write this book? Share with the students that the author, Kirra Somerville, is a descendant of the Martu people of the Western Desert in Western Australia. 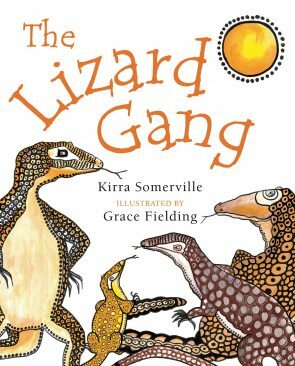 Kirra wrote The Lizard Gang when she was nine years of age (see inside back cover). Using an interactive Aboriginal language map to locate Martu country. See also the Kanyirninpa Jukurrpa website. Discuss why Kirra might have been interested in lizards. Discuss the illustrator, Grace Fielding (see inside back cover). Help the students make a connection between Grace’s life and her paintings (e.g. earthy colours, dot painting detail). Talk about other books Grace has illustrated. Re-read the narrative and encourage students to share what they found interesting. Record the ideas on butcher’s paper, on an e-note using the interactive whiteboard or in the class ‘Wondering Book.’ Model think-alouds that have been inferred from reading the book. Hint: place post-it-notes or tags on the pages where you would pose a think-aloud as it is easy to re-read the story and forget to stop at key points. This approach also ensures that your think-alouds are related to different characters and events. Explain to the students that in each reading they may notice something new: some of what they notice may be written in the book while other information or clues will come from what they infer from the story. This experience is designed to support students to see that literal information does not tell the whole story and that authors and illustrators provide additional information that is not written as text, about the characters, setting and moral to ensure we have a fuller picture of the story. This information will also be useful for students to refer back to when they engage in the rich assessment task. Ask students to sit in a circle with four hoops in the middle of the circle. Explain that the task is to sort out pieces of information about the characters into appropriate hoops. In each hoop place a picture and the name of one of the characters: Boo, Zoro, Eliza and Zed. Show the students the words you have written that have been taken from their wonderings and the class chart created based on facts and inferred knowledge. Read out a character trait and then ask a student to place the card in the correct hoop and justify their thinking. This activity can be done as a whole class or small group experience. Once all the words have been distributed, discuss how you can form a summary about each character. Role playing each character within small groups is another option to ascertain students’ understanding of the unique dispositions of each character. As a follow up experience the differences and similarities between characters could be explored through using a Venn Diagram (PDF, 83KB) or Triple Venn Diagram (PDF, 84KB). If Venn diagrams are new to the students, this may need to be a teacher led discussion. Re-read The Lizard Gang modelling fluent reading. Explain to students that you are going to play a game of ‘Who is this?’ This game will require each student to craft three clues about their favourite character and then see if a partner can work out the identity of the character. Maintain the third person voice by using pronouns so that the narration is consistent with the book. He is the biggest lizard. He can carry logs on his back. Students can rotate through multiple partners, sharing their clues and knowledge of the different characters. Discuss how it is easy to match clues to the correct character when we use literal information but harder when the clue is based on inferential information as readers infer different meanings. Copy several pages from the book or scan to project onto an interactive whiteboard. Discuss with students what order the pictures should be placed in to retell the story as it was told by the author. This experience could be a whole class, small group or partner activity. Complete a senses chart (PDF, 153KB) to capture what the characters could see, hear, feel, smell and taste in the story, or a text investigation grid (PDF, 165KB) to record wonderings and discoveries. Revisit the initial discussion where the social purpose for reading was discussed. Clarify that this book was written to entertain readers and as such is a narrative. Introduce a non-fiction book about lizards, such as Lizards by Rose Davin or Lizards by Nic Bishop. Read through the book or a section of the book. Ask the students to be reading detectives and suggest the social purpose for reading this book. Record ideas on butcher’s paper, in e-notes or in the class Wondering Book. As a class compare the The Lizard Gang and a non-fiction book about lizards. What is the social purpose for reading? For more language features and information of organisational frameworks refer to the First Steps Writing Resource Book. Once you have identified the features of the different social purposes for writing, explain that the focus for the next activity is on writing to entertain, just like Kirra Somerville did in The Lizard Gang. Ask students what the problem/complication is in this story. Record their ideas. Then discuss how the lizards solved this problem and record students’ suggestions. Explain that texts that entertain us have problems (or complications) that are usually solved or resolved. We call that a resolution. Reading about a happy resolution entertains us. Even though some resolutions may be sad, the books are still entertaining because we share an experience with the characters. Read a selection of several narratives and ask the students to identify the complication and resolution in each. Identify which narratives have happy endings and which narratives have sad endings. Ask students to create a simple story map by identifying or illustrating orientation, complication and resolution of another narrative shared with the class. Fold a piece of paper into quarters and ask the students to write the title in the first quadrant, and what they know about the orientation, complication and resolution of the narrative in the other three quadrants. Tell me more about what you have done here (written or drawn). What happened in the orientation, complication and resolution? What was the lesson learnt in the narrative? What was your favourite part of the narrative? Revisit the rich assessment task from the ‘Responding’ tab where students created a story map for The Lizard Gang. Re-enact the story with students, pointing out the events in the story that are high energy and those that are low energy. This could be explained as the heartbeat of the narrative and just like our heart beats at different rhythms, so too does a narrative’s heartbeat. Extend this analogy by drawing a mountain on butcher’s paper, in an e-note on the interactive whiteboard or by using an enlarged copy of the template (PDF, 116KB). Ask students how their heart would beat if they were to run up this mountain. You could represent this visually as you would see it on an electrocardiogram print out. Label the bottom of the mountain ‘Orientation’, the opposite side ‘Resolution’ and the top of the mountain ‘Complication.’ Ask students to help place the events over the mountain representing the heartbeat of the narrative. This can be done through writing what is happening at that time or using illustrations from the book. Identify all the action verbs that are used to indicate speech and list them on butcher’s paper or similar. Use the sentence on page thirteen ‘Off she leapt into the rushing waters with a swish of her tail’ in a text innovation experience. Ask students to change the words that are a different colour (in bold here). Discuss the role of these words and how different authorial choices offer readers different experiences. Split the class into two groups and assign each group a goal: e.g. Constructing Eliza as clumsy or lacking confidence in her own abilities, or constructing the situation as more perilous or more mundane. In a teacher-directed class discussion, show page four to the students (introduction to Zed). Read the text or have the students read the text with you. Although this sentence is about Zed, it’s also comparing Zed to the other lizards. Ask the students to identify the words that compare Zed to the other lizard (e.g. biggest, best and strongest). Examine the introduction to Zoro (page six, fattest, best, highest), Eliza (page seven, skinniest, fastest) and Boo (page nine, smallest) and find the comparison words. Write the target words on flashcards and ask the students if they notice a pattern with the words (e.g. root word and ‘est’). Ask the students what meaning ‘est’ adds to a word? ‘Est’ is a superlative, which is a comparison of the upper limit. Talk about when students have heard or used ‘er’ comparatives and ‘est’ superlatives. Investigate syllable patterns in the superlative words by counting how many times your chin moves when saying these words. What do you notice about these words? (root word and ‘set’ suffix). Ask students to create a new character for The Lizard Gang using their own self portrait as inspiration. Ask them to describe what their character is the best at, ensuring that they use superlative adjectives (ends in ‘est’). They then extend this by providing evidence of their claim. For example, ‘I am Fred. I am the bravest lizard. I can walk in the dark and not get scared.’ This can then be made into a class book. Students could also record themselves reading their page and using an app, such as Book Creator or StoryKit. These could be made into an e-book and shared with others using a range of websites e.g. the Scribblitt site. How does your character speak? Are they kind/bossy/sweet/silly/etc.? How would your character stand (tall/arms crossed/hiding/etc.)? Does your character speak fast or slow? Does your character move slowly or quickly? Students then engage in Character Interviews where they are able to discuss how they, as authors, constructed their character (see More Resources tab below for more information on ‘character interviews’). This provides insight into how they have considered literal and inferential information from the book and innovated on this knowledge. What would they say about each other? How would they talk to each other? Would they work together as a team and cooperate? Would one help the other? If this is the first time engaging in a task with levels of inferential understanding, scaffold the experience by choosing one character from the book for all students to make their connection and/or comparison. Visit the Magabala website for information on Kirra Somerville. First Steps Resources: all activities and strategies are from First Steps Writing Resource Book.